Amitābha or Amida (阿彌陀佛 Ch. Āmítuó fó (=Amida Buddha), 阿弥陀佛 Kr. Amita Bul (Amida Buddha), 阿弥陀如来 Jp. Amida Nyorai (=Amida Tathagata), the Buddha of Limitless Light (無量光佛), also Amitāyus, the Buddha of Limitless Life (無量壽佛), is the primary Buddha of the Pure Land school of Buddhism which developed and spread in China, Vietnam, Korea and Japan and has grown to become the largest sect in Buddhism. Amitābha is believed to be a Buddha who possesses infinite meritorious qualities; who expounds the dharma in his pure paradise (Sukhāvatī) in the West, hence the name Western Pure Land and who accepts all who call upon him irrespective of their merit or religious or worldly status. This all-acceptance is the basis of his great popularity. This concept, personified or otherwise, can be translated variously but is usually shortened to Āmítuó fó in Chinese, Amida-butsu in Japanese, Amit’abul in Korean, and A-di-đà Phật in Vietnamese. 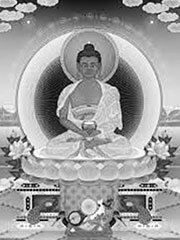 Amitabha is undoubtedly the most well known and popular of the Five Wisdom Buddhas; the other four being Vairocana, Akshobhya, Ratnasambhava, and Amogasiddhi. According to tradition Amitabha was in ancient times a king who, having come in contact with the Buddhist teaching, renounced his throne and became a monk with the name of Dharmakāra. He resolved to become a Buddha and in this way to come into possession of a paradise in which all who call his name might be born into a life of unbounded joy. This is the result of his forty-eight vows 四十八願, of which in the eighteenth and nineteenth, he promises not to achieve supreme perfect enlightenment until he has saved all sentient beings in his paradise. The basic doctrine concerning Amitabha and his vows can be found in the Amitābha-sūtra and the Infinite Life Sutra. Amitabha can be very difficult to tell apart from Shakyamuni, as both are portrayed as possessing all the attributes of a Buddha but have no distinguishing marks. He can, however, often be distinguished by his mudra: Amitabha is often depicted with the meditation mudra (as in the Kamakura statue) or the exposition mudra, while the earth-touching mudra is reserved for Shakyamuni alone. Amitabha is usually portrayed as having two assistants: Avalokiteśvara (Guan Yin) who appears on his right and Mahāsthāmaprāpta (Shì Zhì) who appears on his left. The Panchen Lama, the second highest ranking lama after the Dalai Lama in the Gelugpa sect of Tibetan Buddhism, is believed to be an incarnation of Amitabha. Amitabha is red in color. In Tibetan Buddhism, red is the color of love, compassion, and emotional energy. His direction is the west. It is in this direction that sunset takes place and indeed he is envisioned as the setting sun (red). He is seen as the supreme power and energy of nature, cast on an earthly plain, accessible to all sentient beings. It is little wonder that he is one of the most popular of all Dhyani Buddhas. His unique emblem is the lotus. He is thus associated with all the attributes of the lotus: gentleness, openness, and purity. The Tibetan mantra of Amitabha is ‘Om ami dhewa hri’. Various mantras invoking his name are commonly used by modern Amidist schools, particularly 南無阿弥陀佛, read Nàmó Āmítuó fó in Chinese, Namu Amita bul in Korean, Namu Amida butsu in Japanese, and Nam-mô A-di-đà Phật in Vietnamese. Buddhist monks in China and Taiwan are greeted by saying Āmítuó fó. Occasionally, lay devotees of Buddhism address each other in this same manner. The Japanese and Korean form of the mantra is frequently used in prayers for the dead, and sometimes simply to express respect for the dead, somewhat similar to the way some Roman Catholics and Eastern Orthodox make the sign of the cross after mentioning a dead person’s name. The first known epigraphic evidence for Amitabha is the bottom part of a 2nd century statue which has been found in Govindo-Nagar, and is now at the Mathura Museum. The statue is dated to «the 28th year of the reign of Huvishka», that is, sometime in the later half of the 2nd century during the period of the Kushan Empire, and dedicated to «Amitabha Buddha» by a family of merchants. The first known sutra mentioning Amitabha is the translation into Chinese of the Pratyutpanna Sutra by the Kushan monk Lokaksema around 180 CE. This work is said to be at the origin of Pure Land practice in China. The appearance of such literature and sculptural remains at the end of the 2nd century suggests that the doctrine of Amitabha probably developed during the 1st and 2nd century CE. Some scholars have pointed out the strong Central Asian connection surrounding the Buddha Amitabha, and a possible influence by the Iranian cult of Mithra. The Buddha Amitabha (literally meaning «Infinite radiance») with his Western paradisiacal «Pure Land» «seems to be understood as the Iranian god of light, equated with the sun» (Foltz, «Religions of the Silk Road»). The very notion of paradise is a Persian invention (Old Persian: «Para Daisa»), which may have been relayed by the Indo-Greeks or through the incursions of the Indo-Parthians in India.